BEN WATTENBERG: Welcome back. In Act I, we saw the close of the American frontier, an immigrant wave, the new uses of social science in politics, a free-market economic boom, and America's worst economic crisis. It would get worse before it got better. Like so much that transpired in America in the 20th century, World War II was, at its root, about liberty -- preserving it, defending it, reinstating it, expanding it around the world, where it was directly threatened, and in America, where it was not. Let's pick up the story. As the 1940s began, America was still struggling to emerge from a depression that had already stretched to a full decade. The New Deal programs may well have cushioned the blow but did not end the crisis, not by a long shot. Nonetheless, the American people continued to display a characteristic optimism. A Roper poll for Fortune Magazine showed that 71 percent of respondents thought the country would return to an era of expansion and opportunity. But many intellectuals were much more pessimistic. DAVID KENNEDY: Just as an earlier generation of Americans at the end of the 19th century had thought that the closing of the frontier, the end of the frontier, had closed a major chapter in American history, so too did many people in the 1930s think that the Depression marked the end of an economic era, the end of an era of growth. The economy had matured was the way that they described it, and they thought it was not very likely that it would ever again grow at the rate that it had for the preceding century or so. BEN WATTENBERG: But then something happened. Sixteen million Americans went off to fight, one out of every nine Americans. Four hundred thousand of them would lose their lives. Worldwide, 80 million people were killed. 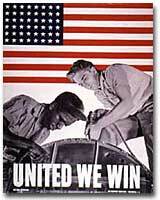 But for America, the Second World War was also an engine of huge social and economic change for the better. WILLIAM O'NEILL (Rutgers University): It's kind of a terrible irony, in a way, that the solution to America's problems was World War II. BEN WATTENBERG: The war did what all the New Deal programs of the 1930s had failed to do -- end the Depression. Factories long idle, plants running at a fraction of capacity, now geared up for flat-out war-time production. At its peak, the United States rolled out a ship every day and an airplane every five minutes. All that production put money in people's pockets. Suddenly everyone was working. In 1938, the unemployment rate was 19 percent. In 1944, it was 1 percent. WILLIAM O'NEILL: Except for those who served in battle, the war was probably the best thing that had happened to the American people in the 20th century. For those at home, it meant unprecedented prosperity. Income levels had never been as high at any point in history before that time. DAVID KENNEDY: We were the only belligerent country, the only country that fought World War II, that managed to increase its civilian standard of living even while it was fighting the war. In this country, we had more guns and more butter, too. BEN WATTENBERG: The war set people in motion. Defense plants in the industrial North and Far West became magnets for huge migrations of job-seekers from the South and East. From 1940 to 1950, 8 million people moved to the West Coast, the largest western migration in American history. DAVID KENNEDY: One historian has described it as it's as if some great hand reached down and tipped the whole continent westward, and people just slid, especially from the Midwest and the South, to the West Coast, which nearly doubled its population in the war. You might say the war was a kind of demographic cauldron in which the American people were churned as they hadn't been probably for 100 years, since they first burst across the Appalachian crest in the early 19th century. "In some communities, employers dislike to employ women. In others, they are reluctant to hire Negroes. We can no longer afford to indulge such prejudices or practices." On the eve of World War II, three out of four African-Americans still lived in the South -- the poorest people in the nation's poorest region. Nationally, they were more likely than whites to work in unskilled jobs for lower pay; 39 percent of what whites earned. By today's standards, almost nine out of 10 were below the federal poverty threshold. And due to Jim Crow segregation laws, less than 5 percent of eligible blacks in states of the old Confederacy could vote. At first, it looked like the war wouldn't change much of that. At the beginning, blacks were excluded from the Army Air Corps and the Marines. In the Navy, they could only serve as kitchen staff. The Army accepted blacks, but they could only serve in segregated units commanded by white officers. Many defense plants did not want to hire blacks. But in 1941, A. Philip Randolph, president of the Brotherhood of Sleeping Car Porters, threatened to have 100,000 blacks march on Washington to protest job discrimination. WILLIAM JULIUS WILSON (Harvard University): The very idea of having to march on Washington during the war was really a very important symbolic change in the way that blacks were addressing the problems of race in America. BEN WATTENBERG: President Roosevelt yielded to Randolph's demand. He issued Executive Order 8802 prohibiting discrimination in defense jobs or government. The lure of well-paid jobs pulled blacks out of the South and into the war plants in the North and West; 700,000 blacks during the course of the war. In the peak year of 1943, 10,000 blacks per month arrived in Los Angeles alone. Black women, who had earned $3.50 a week as domestic servants back in the South, found themselves making $48 a week in the aircraft plants of Los Angeles. By the war's end, African-Americans held almost 8 percent of all defense industry jobs, not far from their proportion of the total population. The number of blacks working for the federal government more than tripled. WILLIAM JULIUS WILSON: What it meant was that blacks gradually developed a working-class population. Prior to this time, they were overwhelmingly impoverished. But after World War II, you saw the gradual development of a black working class. And so the entry into these goods-producing industries was a stepping-stone into higher status. BEN WATTENBERG: The gains were not just economic. When blacks migrated seeking better jobs, they left the Jim Crow South far behind. DAVID KENNEDY: Blacks now moved to places in the country where they could vote, which they could not do in any appreciable numbers in the segregated pre-World War II South. BEN WATTENBERG: The war's impact on blacks is reflected in the numbers. Between 1940 and 1950, the black population of Mississippi went down by 8 percent. The black population of Michigan went up by 112 percent; California up 272 percent. In 1939, black males earned 41 percent of what white males earned. In 1947, they earned 54 percent of what white males earned. The war also created new opportunities for women, now desperately needed to keep defense plants running. Today, most of us are familiar with the story of Rosie the Riveter. Anecdotal histories and government propaganda have made Rosie the symbol of war-time working women. ("Rosie the Riveter" song.) But just how typical was Rosie? ALICE KESSLER-HARRIS (Columbia University): The Rosie the Riveter image was an exaggerated image. It was typical of a few women, and it was perhaps how most women imagined themselves, even as they were doing dreary work. But, in fact, it was an exaggerated image. BEN WATTENBERG: The numbers give a sense of proportion. Nearly 2 million women worked in defense plants during the war, half a million in the aircraft industry alone. Two hundred twenty-five thousand women worked in ship-building. That's a lot. But these women never made up more than 10 percent of the total female work force of 19 million. DAVID KENNEDY: If you look at the whole distribution of what women were doing in wartime, you might say the typical woman war worker should be called Sally the Secretary, or, in fact, maybe even Molly the Mom, because most women persisted in their traditional functions during the war. BEN WATTENBERG: The biggest difference was in who those workingwomen were. Before the war, women who worked were typically young and single. That began to change. Thanks to the wartime labor shortage, working women were more likely to be middle-aged and married. In 1940, 36 percent of workingwomen were married. In 1944, 46 percent were married. In 1940, 43 percent of working women were 35 or older. By 1944, that number had jumped to 62 percent. World War II had one other very significant benefit for the United States. WILLIAM O'NEILL: When the war ends, the United States is the only first-class economy left in the world. It's the only one. And it retains that position for, oh, 10, 15 years after the war. So you couldn't ask for a better start to peacetime for Americans. FILM CLIP ANNOUNCER: Goodbye to the Army for these GI Joes at Fort Dix, New Jersey. BEN WATTENBERG: Nineteen forty-five, World War II ended. Johnny came marching home again. The GIs invaded America. But beneath the homecomings and the hoopla, there was deep concern. What would happen to those 10 million veterans now returning to civilian life? Even as the war raged, government planners had gloomy visions of millions of vets standing in Depression-scale unemployment lines. Then, in March of 1944, Congress passed and the president signed a critical piece of legislation. FILM CLIP ANNOUNCER: In the presence of senators, congressmen, and the heads of veterans' organizations, President Roosevelt signs GI Joe's bill of rights. DAVID KENNEDY: The GI bill ironically was originally conceived as a way to ease the transition of demobilized veterans back into the economy, because many people feared that the Depression of the '30s would return after the war. So some device had to be found to slow down the return to the work force of these veterans. But ironically, the way the GI bill actually played out was a tremendous bonus to their skill level, their educational level, which, in turn, fueled the productivity of the economy in the post-war era. BEN WATTENBERG: Almost 8 million veterans received educational benefits via the GI bill. Many went to trade schools or job training, and more than 2 million went to college. From 1930 to 1950, the number of college degrees granted in America went up three and a half times, from 122,000 to 432,000. WILLIAM O'NEILL: Most of them at the time regarded this as three lost years, just taken away. And so instead of doing things in sequence, they did them all at once. They went to college, became engaged, got married and started having children all at the same time. BEN WATTENBERG: With their new wives and newer families, veterans arrived on college campuses in overwhelming numbers. At the University of Minnesota in 1947, of 30,000 students, 60 percent were veterans, and a third of those were married. At colleges across the country, married vets lived in on-campus housing with names like Vetsburg or Fertile Acres. Much of the veterans' housing was makeshift military, but the company they kept in their new barracks was clearly an improvement. In college or out, veterans were marrying and starting families. In 1946, there were almost half again as many marriages as in 1940, which led very quickly to the baby boom. Just nine months after demobilization, the number of births began to soar to 2.9 million per year, and kept on soaring. Demographers had expected a baby boom when the wartime separations ended, but this one just didn't stop. The Energizer Bunny just kept going and going and going. Over the course of 18 years, from 1946 to 1964, 76 million American babies were born. At its peak in 1957, a dozen years after the war, the total fertility rate topped out at 3.8 children per woman. That's higher than the current rate in the less-developed Third World countries. The baby boom was monumental, but it was more than just an event. It is a process that will take 100 years to play out, from cradle to grave. 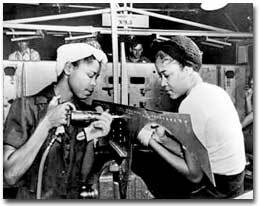 African American women working in WWII. Courtesy of the National Archives.